A very Happy Thanksgiving to all our regular readers (both of you) and anyone else who happens to stumble upon this site via Next Blog, Google, Twitter, or sheer grace (for us, your call from your end). God bless you! We're thankful for all of you. Eat massive amounts of turkey, dressing, cheese grits, green bean casserole (with extra fried onions), rolls, butter, mash, gravy, mac 'n' cheese, deviled eggs, sauerbraten, cannoli, toad in the hole, escargot, Beef Wellington, pork ribs, salmon, chocolate pie, bratwurst, sukiyaki, pickled herring, corn on the cob, steamed corn, cornbread, corn muffin, Mexicorn, Corn O'Brien**, Shrimp Etouffe, Carne Asada, Li Hing Mui, Pad Thai, Kung Pao Chicken, Kung Pow Chicken (a spicier variety), bangers, bacon, back bacon, side bacon, streaky bacon, Bacon Salt, pastrami, Camembert, Brie, Stilton, (see Monty Python Cheese Shop sketch for subsection of this menu), Haggis, bacon and cabbage, Irish Stew, Mulligan Stew, Panda Stew, Mulligatawny, gnocchi, matzo ball soup, paella, boiled peanuts, flan, Lobster Thermidor, Marmite, Vegimite, Nutella, ramen, Coq au Vin, Crab Rangoon, Chicken Vindaloo, Chicken Korma, Chicken in a Biscuit, Kim Chee, biscuits, crisps, chips, dips, and Wonder bread. * Yes, this is one of the oldest jokes in existence. Holiday tradition demands we dredge it up though! Ok, its really supposed to be American Music Awards but if anyone saw the broadcast they know what I'm talking about. Alright, as a matter of full disclosure I only saw a wrap-up of the most freakish highlights but that couple of minutes was like living a thousand years of it. It was like going to the store to pick up milk and eggs only to find out you're having to feed the entire road crew for the U2 360 Tour. I had to scrub my eyeball's down for an hour after watching the video clip. I was hoping with all my heart that Lady Gaga would show up and bust a bottle on my eyes. You get the point. Beyond the much publicized events of the evening there were also many that missed the well trained eye of the media. Here is a full list of the events, won't you re-live the banality with me. Rihanna performs a number that turns out to be a cheap LED fueled take-off on Bono's Ultraviolet gear from U2's current tour. Maybe it was her way of warding off Chris Brown by blinding him. 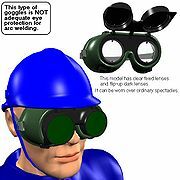 Jay-Z turned out to be the only person NOT blinded by Rihanna's laser light show due to his trademark arc welder's sunglasses. Not to scale, those worn by Jay-Z are much larger. Kanye West interrupts the proceedings no less than ten times to explain that he is still sorry about that whole Taylor Swift thing but that Beyonce's video was the best of all time and Imma let Seth Green finish in minute. Eminem and 50 cent (pronounced fiddy sent) stole the show with a rousing rap spectacular that thrilled old and young alike. The most poignent moment of the song was when Eminem rapped, "It's bleepy bleeping bleep to bleep the bleeping bleeper. ", to which came Fiddy's riposte, "Bleeping bleep the bleeping bleeper bleeped." There was not a dry eye in the house. Michael Jackson did not show up at the event to accept the Lifetime Achievement award surprising nobody of course but Amy Winehouse. Lady Gaga thrilled the crowd by burning down the stage after dousing it with vodka and breaking a bottle over Seth Green's cranium. What can be done to top this year's proceedings? I like the idea of setting off a small thermonuclear device but I fear Jay-Z's glasses would render it ineffective. Maybe close down the bar earlier.